If there is one thing that everyone appreciates, it's good service delivery. The helpful attitude, the good time-keeping, the efficiency of processes, the demonstration of competency and the respect of people as customers, is all very desirable. Any organisation that is consistently achieving these things has a right for continued existence in the competitive world of business. It is unfortunate when service delivery is second best. It does take much for an organisation to begin to acquire an undesirable reputation for poor service delivery. Here explained are some factors that are probable causes of poor service delivery. The provision of services to customers/members at the desired level is always dependent upon the collective skills and knowledge resident within the organisation. Quality sport and recreation experiences are determined by whether coaches, instructors, officials, administrators, event managers and other ancillary support staff have had an appropriate level of training for the role they perform. In reality, organisation generally operate on meager budgets where expenditure on training is a lower level priority. Furthermore, the cost of providing training is not factored into the delivery cost of sport programs and this makes it even harder to justify expenditure on training. It is almost as if many organisations expect their volunteers and staff to come already with the skills and knowledge they need. Without training, there is a systemic cycle of doing what has always been done and this stifles development. While everyone hopes for a high level of service delivery, most people are reluctant to pay for more than a middle-of-the-road level of service delivery. In other words, organisations are faced with demands for improving service delivery, but consumers of the services are very reluctant to pay more. This leads to funding shortfall and services have to stay at a same level. 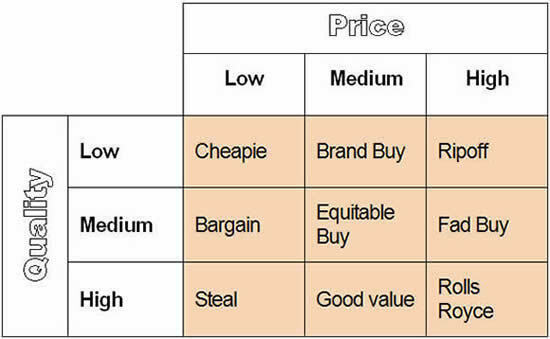 On the diagram below the "Equitable Buy", that is a medium quality at a medium price, is where organisations need to pitch their service delivery to please most consumers. However, there is always a segment of the market that want a "Rolls Royce" product and will move from club to club looking for it. There is also a segment of the market that can only afford the "Cheapie" and sport organisations often make efforts to cater for this group for social equity reasons. Sport organisations, and indeed the entire sport system, depend heavily on volunteers. In addition to the likelihood that volunteers need training that they do not receive, there is also the immense problem that volunteers are too few in number. This leads to burnout and a rapid cycling of volunteers. The reliance on volunteers also means that service delivery within the organisation must fit the availability of the volunteer. If there is a demand for services outside of normal hours of operation, then the demands cannot be met and is left unsatiated.